Residential communities are being choked by trucks hauling packages from Fresh Direct, Amazon, Zappos and other companies that didn't exist 30 years ago — and our streets have not adapted. Residential streets are no place for double-parked trucks, which endanger cyclists and also block the flow of car traffic (which endangers cyclists further). 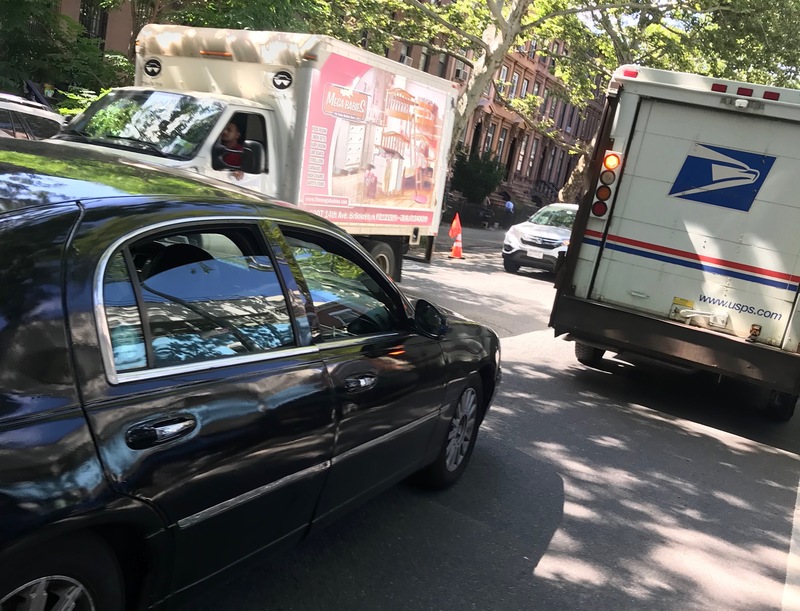 The villains, of course, are the delivery companies: FedEx, UPS, United States Postal Service, DHL, Fresh Direct and others routinely double-park on residential streets. We have met the enemy, and it is them. But it’s also us: As customers, we placed the orders and now we want our stuff. And when the truck rolls up, there’s no place for it to park because car owners have appropriated both sides of the street for free vehicle storage. A USPS truck in a bike lane on Sands Street in Brooklyn. Photo by Gersh Kuntzman. 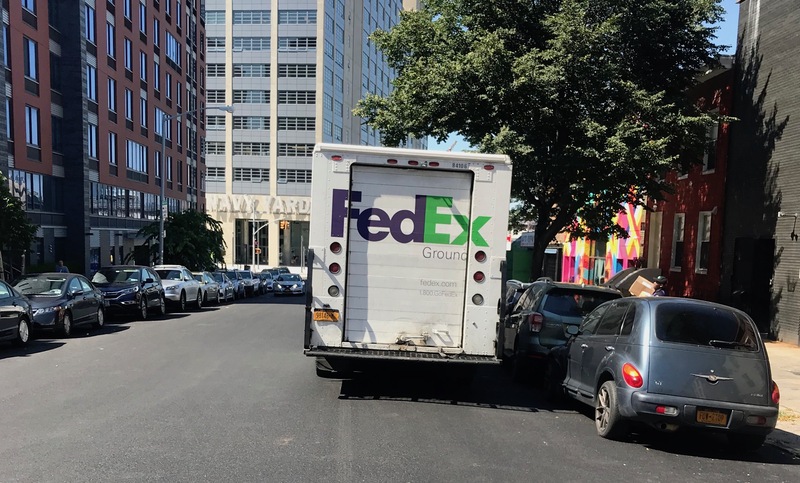 A FedEx truck blocks half of two-way Vanderbilt Avenue in Brooklyn — a bus and bike route. Photo by Gersh Kuntzman. I tweet at the companies, which sometimes ask me for the location of my photos. But they never answer the question: Is it company policy to encourage drivers to double-park, which is almost always illegal? Of course I’m sensitive to hard-working delivery people doing their jobs. So let’s make it easier for them: residential neighborhoods are getting more and more packages, so residential streets need the kind of loading zones as commercial districts. 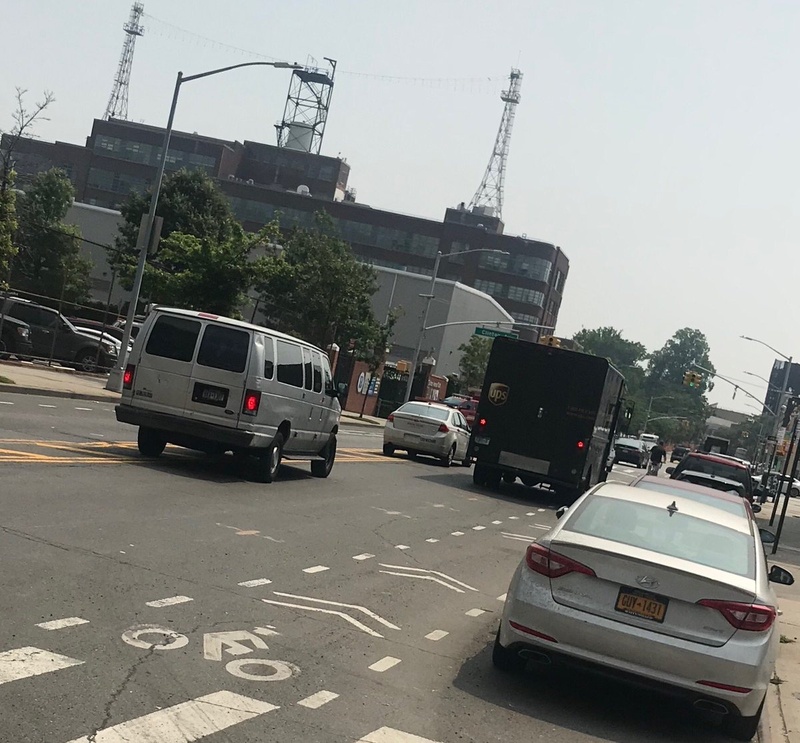 I’m going to be pursuing this issue over the next few weeks — exploring roadway design, company policies, parking statistics, the NYPD’s misplaced priorities, and, of course, the city’s infamous Stipulated Fine Program program — but for now, I need your help documenting the problem. Next time you see a delivery truck illegally parked, take a picture and send the photo and details to me at tips@streetsblog.org. Or just post on Twitter with the handle #loadinglosers. This feels like a mean-spirited and misguided campaign. How does attacking delivery workers as “losers” help promote safe streets? “[A] person may stand a commercial vehicle alongside a vehicle parked at the curb at such locations and during such hours that stopping, standing, or parking is not prohibited, while expeditiously making pickups, deliveries or service calls, provided that there is no unoccupied parking space or designated loading zone on either side of the street within 100 feet that can be used for such standing, and provided further that such standing is in compliance with the provisions of §1102 of the State Vehicle and Traffic Law. A person may stand a commercial vehicle along the roadway side of a bicycle lane provided all other conditions of this paragraph are met. No person may stand a commercial vehicle in or along the roadway side of a bus lane, unless otherwise indicated by posted signs, markings or other traffic control devices, or at the direction of a law enforcement officer or other person authorized to enforce this rule.” NYC Traffic Rules § 4-08(f)(1). 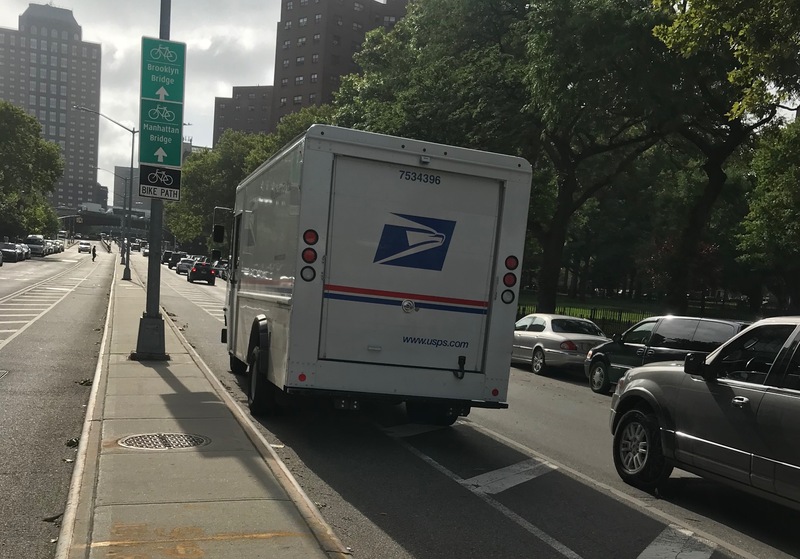 Off all the photos in the post, the only parking job that’s clearly illegal is the USPS truck on the Sands St bike lane. “The delivery companies” are certainly responsible for their trucks that double-park, but if we can point to any “bad guys”—they’re those who squat their vehicles long-term on the choice real estate that should be designated for short-term pickup and delivery. If you’re “sensitive to hard-working delivery people doing their jobs,” then don’t blame them for doing those jobs in the only way left to them. At least these double-parking trucks are contributing something to the city’s economy, unlike non-commercial “single parkers” that merely store their personal property long-term for free on prime NYC real estate. And it’s not enough to say, “residential streets need the kind of loading zones as commercial districts.” Residential streets need to stop allowing long-term free or low-priced parking of personal vehicles altogether. The villains are NOT the delivery trucks. This is poor journalism that I would not expect to see published on streetsblog. The villains are the curbside parkers that hog the free or underpriced curbside space. The delivery trucks must conduct business and have no option to park legally. Online shopping is the new reality. People like the convenience. There needs to be adequate curbside space for commercial vehicles, for loading/unloading – and this curbside space MUST be enforced against parking placard abusers who would hog the space. The double-parking by commercial vehicles is a result of flawed policy regarding curbside space. Changing curbside policy should be the focus, not the commercial vehicles that have no choice other than to double-park in order to conduct business. My daily commute has me biking down Dean and Bergen, both residential streets with bike lanes and lots of double parking. I would much rather commercial vehicles double park legally on the side of the street with no bike lane than illegally in the bike lane so that cars have to merge into the bike lane to pass the truck instead of me merging into the car lane. No. I’m usually 100% on board with stuff like this, but no. The delivery drivers have been placed into a literally impossible position here: there is absolutely no way for them to do their jobs without double-parking. If we want this to stop, we need 10-minute loading zones on every block. I hate double parking; but this driver is doing a good thing by staying out of the bike lane. Ideally he should go find legal parking, even if that means he has to walk several blocks with the packages. But, if I saw this, I admit that I would thank the driver for not blocking the bike lane. Anyway, in general, this is a good project. Double parking, like speeding, is a menace that should be an enforcement priority. The systemic answer to the problem of double parking by delivery vehicles is to remove parking spaces in favour of loading zones. But, until that is done, we are entirely in the right to insist that delivery drivers find legal parking; and we should continue to complain to their employers when they do not do so. It is not true that “there is absolutely no way for [delivery drivers] to do their jobs without double-parking”. Finding legal parking may be difficult; and it will certainly take time, which translates into a cost to the delivery company. But it is not impossible. In addition, delivery trucks should be allowed to stop temporarily in “no stopping” zones such as fire hydrants, and on the restricted side of a street with alternate-side parking. Still, loading zones are the ultimate answer. Go a little closer and take a look at the dashboard of those trucks. I bet you will see a stack of parking tickets. It is treated as just a cost of doing business. How else could they do it? As many others have noted, there is no curb space for them. They have to break the law to do their jobs. Al though I did read somewhere that UPS is trying out cargo bikes for situations like this. That’s what you should be pushing for – cargo bikes, hand trucks, pack mules…anything that wouldn’t block a lane. Anyway this is mostly an interesting digression: for 100% sure we need loading zones here, and also congestion pricing so _that_ can be built into UPS’ cost model in a way that is clearly and obviously not labor’s fault or responsibility. Delivery companies have already had to increase the number of trucks because of traffic delays, further exacerbating the problem. Curb management and congestion pricing are the only solutions. Keep in mind that NYC is much larger than Pittsburgh and Toronto. The volume of packages in NYC may make methods other than motorized vehicle delivery unfeasible or non-economical. It’s also much denser, which could make motorized delivery to neighborhood distribution points and then last (half) mile delivery by alternative means more economical. Residential street don’t need loading zones per session, but they do need to meter parking spots. The status quo is a perpetual game of musical chairs where the winners are those willing and able to waste their time seeking out parking, squatting, and babysitting the car on street cleaning days. Metering residential streets will ensure that there are always a couple of open spots that can be used by delivery trucks. Where? Farleghy is shutting down major ops, which was a huge local op, there is no wharehouse space in Manhattan that has more than like .5 day capacity. Plan will work if southbound cyclists decide to use a new bike lane on Clermont Avenue, one block to the west of Vanderbilt. We need to start pricing the curb for what it is worth.